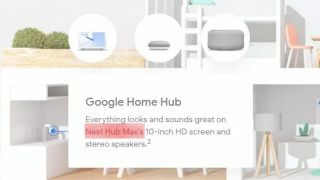 Whoops, Google might’ve just leaked the new Nest Hub Max, a new smart speaker that has a 10-inch HD screen, a built-in Nest security camera and stereo speakers. The description for the new smart home hub appeared for a brief moment on Google’s Connected Home section of its storefront before it was spotted by Android Police, who was kind enough to take screenshots of the product before Google scrambled all the information. According to the information Android Police found, the speaker looks like the evolution of the Google Home Hub: The Nest Hub Max will have a larger display, a built-in security camera and stereo speakers - giving it a clear edge on the smart home hub released last year. Before today, there wasn’t even a rumor of this device floating around (at least, as far as we know) and was something Google was likely hoping to save until its annual Google IO conference in June. Then again, maybe it was just several intricately detailed typos in a row? ...Nah, probably not.